Founded in 1999, The Bay School is a nonprofit, nonpublic school located in Santa Cruz, California. The Bay School provides students with autism and/or developmental disabilities ages 5 to 22, comprehensive, extended year educational and clinical services regardless of their race, national or ethnic origin, age, gender, or religion. The educational and treatment approach used at The Bay School is based on the principles of applied behavior analysis (ABA), a methodology that applies principles of behavior to learning. Our mission is to provide scientifically-based educational and clinical services to produce measurable and lasting improvements in the lives of the students and families we serve. 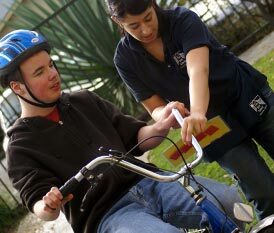 The Bay School is part of the May Institute, a national organization of award-winning programs for children and adults with autism and other special needs. Teaching programs are developed based on each student’s educational and behavioral needs. Individualized educational plans are designed for each student with annual objectives and measurable outcomes. Objectives emphasize the development of language skills, academic skills, social skills, leisure skills, self-help and safety skills. Students' progress is closely monitored by detailed data collection. We work closely with families and encourage them to observe their child in programming, attend parent meetings, and implement teaching procedures in the home. Our focus is on helping our students successfully transition out of the classroom and into the community. Our Community Inclusion and Employment program offers our adolescents and young adults opportunities to engage in valuable volunteer or paid work experiences in integrated community work settings. TBS is approved by the Internal Revenue Service as a 501(C)(3) tax-exempt organization (our IRS non-profit letter). TBS teachers are certified by the California Commission on Teacher Credentialing as Specialists (Moderate-to-Severe) in Special Education. TBS is certified by the California Department of Education, Non-public school division. TBS is a vendor of the California Regional Center, Department of Developmental Service.